The chapter starts exactly where the past one left off, with the Coach Tanahashi greeting his 2 disciples, both Yuri and Megumi can´t believe that he is there! They ask him why is he here? Why is he not on the Isle of Man?! The Coach says that he would never miss the big race of his dear pupils! Anyway, later the Coach is in at Megumi´s Inn and both Yuri and Megumi´s mothers are talking with him, Tanahashi says that England is like a fusion of Winter and Spring so it is colder, the Moms says that then some hot must be well for him! Meanwhile at the kitchen…Both Yuri and Megumi are with their apron and holding a knife, they are ready to make a delicious meal for Coach Tanahashi´s tummy!...Although nor Yuri nor Megumi wants the help of the other! They start arguing saying that the location is Megumi´s or that Yuri is a better chef than her or the ingredients and whatever! On the vicinity, the other girls are seeing and talking about this sudden development, especially because just the other day both girls make amends and have already given up on him… SO this is like on step forward and 2 steps back. Anyway, after that the Coach speaks with both Yuri and Megumi and tells them that sadly he is not doing so hot in England, he had an argument with his partner and left, so he is all alone, at the same time finding another one it´s hard because he is a random nobody, so obviously not a lot of people wants to join him, still the girls says that he is very skilled and he can adapt to either a driver or passenger so soon enough he will get a partner! Still… On the mind of both Yuri and Megumi it is the idea that now that the Coach is alone, if they win one can be his partner! A partnership that will raise the trust and the bonds they have! And alliance that will ignite the flames of love inside the Coach´s heart! 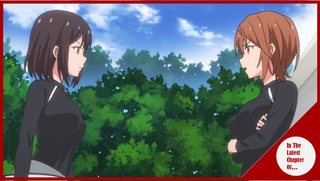 In any case, after some random commentary of the other girls about this whole romantic triangle; Megumi is talking with Yuri about making a truce until the end of the TT, that they won´t be talking with the Coach alone; Yuri denies such thing and says that if she wants she will talk with the Coach about race things… And more other topics. Of course neither of the girls are being honest with the other and keep saying that they don´t feel anything for the Coach, an obvious lie. Still, the time for the exhibition race comes and still both Megumi and Yuri are trying to make the Coach to be the most comfortable possible, on the distance, 2 beautiful and mysterious girls are seeing all of that. Before the race, both Yuri and Megumi try to tell the Coach that they want to tell him something…Alone, both girls are ready to confess to him; still the Coach says that he also has to tell them, to his dear disciples; but he will wait until the end of the race, at the same palce where both girls said their goodbyes to him. The Time for the race has come and both Yuri and Megumi are worse than ever! They aren´t being nice with each other; but no matter what the race starts and our girls are at the last place, as a matter of fact they are 10 seconds behind the first place, which it might as well be a very long distance, although the news team disagree with such notions. The race continues and everyone is giving their all on the race, still the Ashitabamaru girls are giving their best and they surpass the Single duet! Passing all the others, the ones who looked like the losers are edging themselves and making their path to the first place! And they done it! Our local girls have reached the first place!! Now the winners are happy with their victory and are being nice with their partner, except for Yuri and Megumi, they see each other at the eyes and have a simple resolution to put the other one out of the picture when they go to see the Coach… To Ki…I mean to knock the other out! The other will be fine! Just maybe with some pain in her face; but nothing that some ice wouldn´t cure anyway! With the same though both Yuri and Megumi hit each other in the face knocking themselves out! After that, and the fact that their plan didn´t worked out both girls go to the meeting place with the Coach Tanahashi, he is a little nervous since they are his disciples and is proud of them; also he is not someone who talks a lot about his feelings and/or personal life, so maybe he looks like a racing kneeler otaku or something; but anyway, he wants to tell them something. A very entertaining chapter! I didn´t enjoyed it as much as the past week one; but nevertheless I still found myself enjoying this one out! This chapter is basically chapter 1; but now with more information and other point of views, like… Yeah, Back in chapter one the weeks after that I truly didn´t had any idea that such chapter chronologically occurred in the future and that the past ones where more like a prologue; I have mixed feelings in that since well, it´s a twist and well… I have nothing against it, although at the same time it feels a little cheap since the story never let us clear that the first chapter was put on the future and at the same time it feels a little cheap since one see some similar scenes, similar dialogue and similar (if not the same) images, so there is not mystery anymore. On another point, now the cat is out of the bag! Coach Tanahashi has come and has revealed that he is engaged with one of the (hawt) birtuall sisters! I sort of see that happening of that would happen with the Coach; obviously I didn´t knew that it would be with a birtuall sister or in japan, I thought it would be like a final joke or epilogue where both Yuri and Megumi went to England and the Coach would present his special other or something like that, still I think it was an obvious thing… But also a necessary one, I mean it would have been a litle sad (and waay too dramatic for this anime) that Coach would have chosen one of the girls since we would have seen either Yuri or Megumi in a sad state and alone…With no one to cry or anything; but now when both girls are facing the true and the fact that the Coach has found that especial someone and is marrying her, well…Yuri and Megumi still have each other and they can help support each other, to lend themselves a hand and help, like a team and friends, to get out of the sadness they might face now that they know that their feelings won´t ever reach their beloved coach. Finally…Well, we are at the end of the road and the final chapters are at the vicinity, so be ready because the true interesting thing for this anime are coming!